Just add dark clothing, cape or robe to complete your creepy costume! 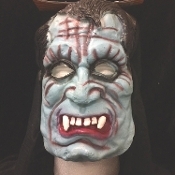 Great for Halloween Decoration, Supernatural Horror Decor, Dungeon Scene or Medieval Torture Reenactment. Adult Size: approx 10-inch (25cm) High x 8-inch (20cm) wide. Total length with Hood approx 12-13-inches, depending on style. -Hood is soft sheer BLACK 100% Polyester knit.